We all know what a sweater is. But do you know - how sweaters are made in factories? Let me explain how sweaters are made through various processes. One more thing I like to share with you that I have worked in a sweater manufacturing company in Dhaka, Bangladesh for two months in 2006. I remember how we worked in that factory. Sample development, sample approvals and order receiving process are similar to garment manufacturing. Other processes are explained here in brief. 1. Yarn sourcing - Yarns are primary raw material for sweater knitting. Factory sources yarn in hank or spool form. The factory I worked had their own spinning mill and yarn dyeing unit. 2. Winding of yarns - In this process yarns are winded into cones from hanks in winding machine. These cones are stored for production. 3. Yarn issue to production - Yarn distributor is employed for distributing yarn cones to operators. Yarn distributor collects yarns from yarn store as per order plan. Yarns cones are given to knitters based on their daily production capacity. 4. Knitting of sweater panels (Flat knitting) - Knitters knits sweater panels manually on flat knitting machine as per the design provided to them. In piece rate production knitting one worker makes all 4/5 panels (front, back, collar and 2 sleeves panels etc.). Number of a sweater panel may increase depending on style. Like a high fashion sweater might have side pockets and belt, front placket. Sweater collar is made in separate knitting machines with same batch/lot of yarns. Flat knitting machines are available in different gauze setting to produce sweaters for different weights. Small components like placket and belts are made in automatic knitting machines. 5. Checking of panels – Quality checker checks 100% panels on a flat table (or under light table). Measurement checking of panels is done randomly. 6. Linking of different sweater panels – Knitted sweater panels are then sent to linking section. Different components of a sweater are joined together by means of linking machine. 7. Trimming – Loose yarns are trimmed in this stage by trimmer. 8. Quality checking of complete sweaters – Sweaters are checked using light checking machine. 10. Button attaching /button holing - Sweaters are available in front opening as well. So button attaching and button holing is done in finishing stage. A sweater design might have zipper for front opening. Zippers are attached. Wash case label and brand label are attached using single needle Lock stitch machine. 11. Sweater Washing - Washing is mandatory process for cotton and acrylic based sweaters. This is also an important process for setting sweater shrinkage. Washing is not recommended for sweaters made of fancier yarns. 12. Finishing - Similar to garment finishing, sweaters finishing process involved checking of pieces, measuring checking, spot removing, repair work (mending) and ironing. 13. Ironing - Sweater stretches easily. Steam irons are used to press the sweater. Measurements are also set in ironing stage by using templates of different sizes. Measurements and pressing quality is checked after pressing. After ironing sweater are kept open to dry the steam. 14. 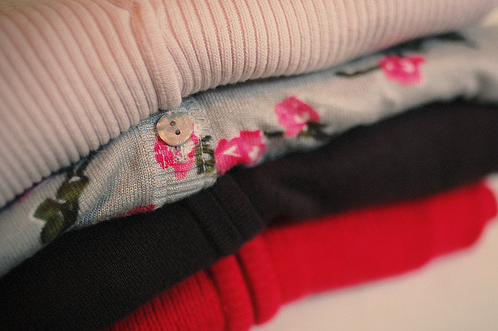 Folding and Packing – Sweaters are folded. Hang tags, Price Tags and other tags and stickers are attached to folded sweaters and packed into poly bags. 15. Internal Final audit – This process is not mandatory but few factories audit sweaters prior to handing over shipment to buyer representative for final inspection. 16. Shipment inspection - Sample based inspection is carried out by buyers Quality Assurance personnel. Now after shipment inspection by buyer representative, sweater are ready for shipping. This piece of article is written based on my knowledge. If something is missing, please help to improve this post. Sweater knitting,Sweater knitting process, check points in sweater knitting process.